There is a very nice post up at 50 Watts that shows pages from the third Hairy Who comic book. The Hairy Who were six Chicago artists who exhibited together in 1966, '67 and '68. Instead of producing catalogs for their exhibits, they produced comics. The artists were Karl Wirsum, Jim Nutt, Gladys Nilsson, Art Green, Suellen Rocca and Jim Falconer. When I was an undergrad at Rice, I took a really great class taught by William Camfield called "Art Since the 40s." One day he was speeding through a bunch of the artists of the 1960s and he put up a slide by Jim Nutt. I sat bolt upright. It was electrifying. He mentioned the Hairy Who, and I decided at that moment that this group would be the subject of my term paper. Camfield cheerfully indulged my obscure desire. The real expert on The Hairy Who is Dan Nadel, who conducted lengthy interviews with them in his eccentric art/comics magazine The Ganzfeld in 2003. Dan Nadel runs Picturebox, one of the best small artbook publishers there is. 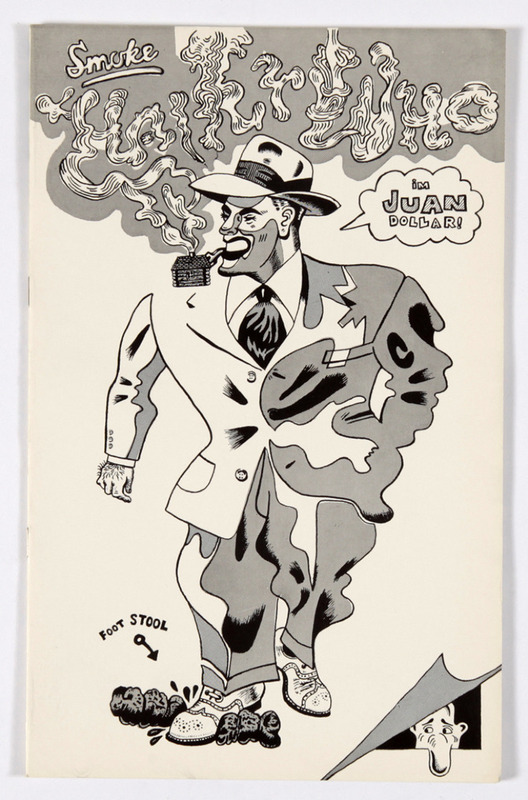 Nadel is selling his copy of this comic (signed by Karl Wirsum) for $750. I have coveted this comic since 1984, but $750 is a little too rich for my blood. But if you have $750 worth of mad money laying around, I highly recommend it.